With society under pressure to meet growing energy needs and lower carbon emissions, Cambridge engineers have collaborated with industry to examine energy use and identify energy savings. Research on energy efficiency by Dr. Jonathan Cullen, Leader of the Resource Efficiency Collective at the Department of Engineering, and his team, has been featured in the BP Technology Outlook (2018) which examines 'the potential of technology to change the way we produce and use energy to 2050'. While looking at efficiency in the global energy system, Dr. Cullen and his team examined global energy use across 35 technologies – from cars and power plants to domestic cooking and washing – setting out the current range of efficiencies along with an assessment of the best available technology today and in 2050. 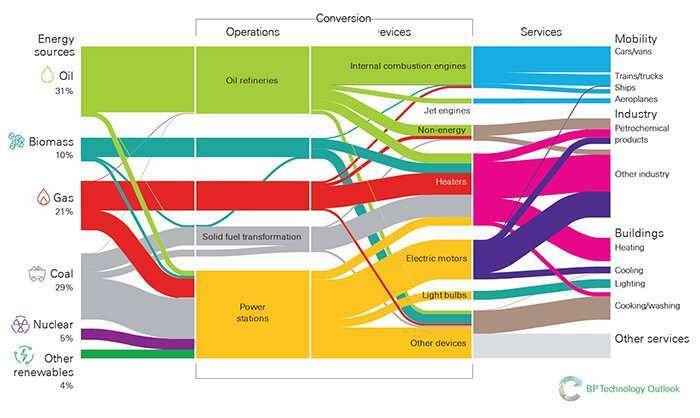 The chart above, known as a Sankey diagram, shows how energy is converted and consumed. On the left are the natural resources that provide energy – known as primary energy. The diagram shows how these resources are converted, for example in industrial operations such as oil refineries or power stations, and then consumed using devices from engines to light bulbs in order to provide us with the energy services shown on the right, such as mobility and lighting. Gas resources, for example, are used to generate power but also piped directly into homes for use in heating or cooking. The width of each strand indicates the quantity of energy involved. Although not reflected in this diagram, energy losses and inefficiencies occur at each stage, and can be material. Dr. Cullen said: "The global energy system consists of a diverse range of technologies for transforming and using energy. Yet it is the delivery of energy services – such as heating – rather than energy itself, which drives consumer energy demand. The more efficiently these technologies operate, the less energy is required to deliver energy services. "In our latest study with BP, we examine global energy use across 35 technologies, provide a technology ranking, and show that total primary energy savings of 217 exajoules (EJ)1, which is about 40% of current supply, and half the technical efficiency limit, could be achieved. "If the maximum practical savings were made, demand for coal, oil, natural gas and biomass would be reduced by 31%, 47%, 40%, and 40% respectively, resulting in annual emissions savings of 13.5 gigatonnes of carbon dioxide. "If proved to be economically viable, energy savings of this order would affect every aspect of the energy supply system. This is why these findings deserve careful attention as we consider our move towards a future low-carbon economy." Cambridge is one of eight partners that have carried out studies over a three-year period with BP focusing on China, Europe and North America. It is hoped the findings will help policymakers consider what additional incentives and measures to introduce based on developments anticipated in technologies known today.